The Largemouth bass is a popular freshwater game fish in the United States. It is a type of black bass and is also part of the sunfish family. 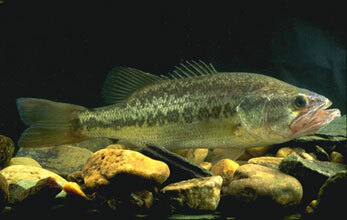 The scientific name for the largemouth bass is Micropterus salmoides. Where do largemouth bass live? 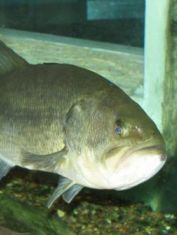 Largemouth bass originally lived in the eastern United States. However, it has since been introduced throughout the world including the rest of the United States, Mexico, South America, and even Africa. The habitat for the largemouth bass is freshwater lakes and rivers. It likes quiet and clear water, but can survive in other habitats. It generally hides under cover below logs, bridges, rock ledges, and anything that will help protect and conceal it. What do largemouth bass eat? They eat a variety of smaller fish including shad, sunfishes, minnows, and bluegills. They have also been known to eat amphibians, reptiles, and small water birds. They are often at the top of the food chain where they live and are considered the apex predator. How big do largemouth bass get? The largest largemouth bass recorded was 29.5 inches long and weighed 22 pounds. The average size is much smaller at around 18 inches long. Coloring of the largemouth varies. It is generally an olive green colored fish with a dark horizontal stripe along each side. The belly is whitish in color. Darker blotches are generally found at the tail. Baby largemouth bass are called fry. They are about 3mm long when they hatch from their eggs. At first they feed on zooplankton, but as they grow they move to insects and small fishes. Fishing for largemouth bass is one of the most popular outdoor sports in the world. It is the most popular and sought after game fish in the United States. They can eat prey that is up to 25 to 35 percent of their body length. Their average lifespan is ten to sixteen years depending on the habitat and environment. An estimated 30 million people fish for largemouth bass in the United States. The male guards the eggs after the female lays them. They will hatch in 5 to 10 days. Their color can vary depending on the type of water they live in. They have a sixth sense called a lateral line that picks up the vibrations of other fish. Largemouth bass can see color and are especially attracted to the color red. It is the official state fish for Alabama, Georgia, Mississippi, Florida, and Tennessee.